Download » this list of contacts to report a Roebuck Bay issue. 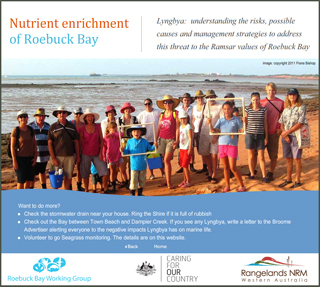 Roebuck Bay has been experiencing worsening blooms of the cyanobacteria, Lyngbya majuscula. This is concerning because fish avoid Lyngbya blooms which can reduce the available catch and large blooms can suffocate the seagrass meadows that dugongs and green turtles rely on as their main food source. Juvenile fish, prawns and invertebrates that hide in the leafy meadows can be suffocated too, which can affect migratory shorebirds who feed on them.